As part of our slapshot challenge it is our mission to help you improve slapshot power and accuracy. 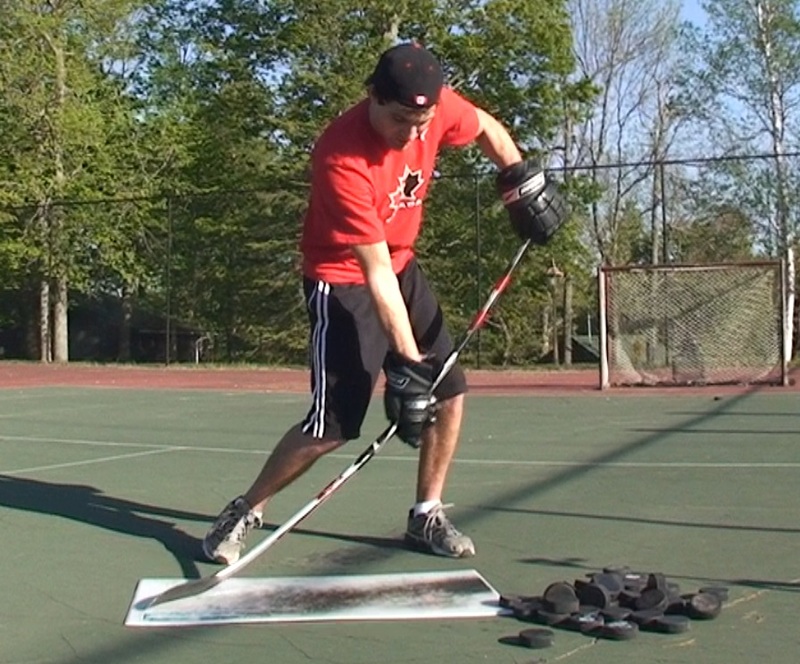 In this article we will show you how to turn your muffin of a slapshot into a howitzer. Proper technique is the most important aspect of your slapshot, in fact by using a radar gun and tweaking just a few things in my technique, I was able to increase my slapshot by 15 mph. After improving my shot substantially, Ken and I went to the hockey expo in Toronto. There was a radar gun there where anyone could test their shot. One guy was in line in front of us who was absolutely jacked, 6 feet tall and muscles rippling from every where. Ken and I were sure he would be able to hit at least 80mph. This guy steps up and struggles to hit 65, still fast, but Ken and I have a lot less muscle and easily topped 70 mph. It just goes to show that proper form is the first thing you should work on. After posting the slapshot challenge video on youtube, and starting a forum thread at the rink we got a number of video responses showing their slapshots. We noticed a few common slapshot technique problems that could be easily fixed for more power. Also while working on improving my slapshot technique I noticed a few changes in technique that really improved my slapshot speed. I have made a list below. Holding the stick too close to the blade is common among people learning the slapshot, as it makes it a bit easier to get the puck off the ice. However this is a bad habit that many players form. To get the most power from your slapshot your lower hand should be just below the halfway point of your stick, this allows you to put more flex on the stick. Also by holding the stick too low you will not be able to get full power from your shoulders and arms. Your back swing in your slapshot should not look like a back swing in golf. You do not want to bring the blade of your stick behind your head, on an angle. The blade of your stick should move more like a pendulum, coming straight back and straight down. 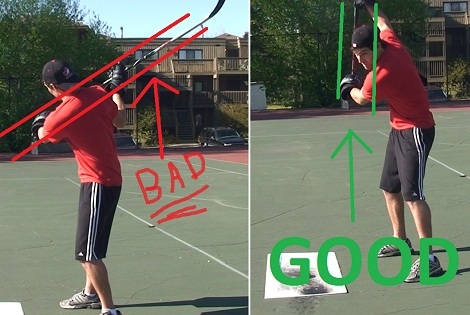 If your back swing and down swing is on an angle you will not get as much power from your shot, and you will not be able to flex your stick properly. This goes along with transferring your weight. A common mistake in slapshot technique (for beginners) is shooting straight legged. If you are shooting straight legged you will not be able to properly transfer your weight. Bending your knees allows you to push off with your back leg, and drive into the shot. While practicing my slapshot I noticed that I would often leave the blade of my stick open in my follow through. By rolling my wrist during the follow through, and continuing to push into the shot I added a few MPH to my top speed. I shot this video that shows you how you can improve your slapshot technique and get more power from your shot. Hi! My little brother is in the 7th grade and he plays hockey. He is doing a science project on slap shots and I was watching your videos. Would it be ok with you if he incorporates your video into his project? I promise you he will cite and reference however you need him to. Please let me know. What you’re doing is great, and I am trying my best to help him out. Great tips! Even though there were some things here I already do, it’s a great reassurance to see that my form isn’t completely off. Your article and videos really compliment each other nicely! hey Jeremy, i have been following you video’s for a while now and in some you say that i could send you a video of me shooting and you could give me some tips. i only play road hockey seeing as i really cant afford all the equipment required as well as paying to play in the league, but i would really appriciate it if there are any tips you can give me or anything. nice shootin jeremy , one day you’ll make it to the bigg leagues ! britts got nothing on you , dont worry .